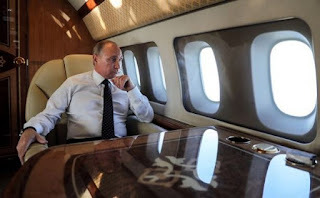 Traveling is a lot of fun for Russian President, Vladimir Putin, as the inside of his private jet looks like a hotel, so complete with a gym, bedroom and conference room. Forget long check-in queues or lack of leg room in a cramped plane, Presidents get their own glamorous jets as they travel around the globe. 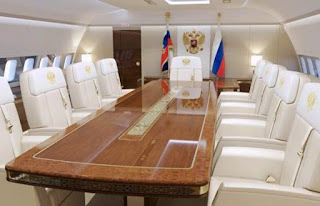 The Russian President will not be slumming it in one of the four private IL-96-300PU planes he flies in, each of which are reported to cost around £390million. Putin flies in one of four planes, but the specific one he’s using isn’t known until take-off for security reasons. The customised Jet he flew to Helsinki with was seriously opulent. Decor includes golden hues, white leather furniture, and marble-esque features. From a gold-plated toilet to a king sized bed and even a gym, these astonishing pictures show the lavish interior of one of Putin’s private jets. 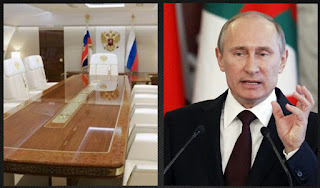 The specific plane to be used by Putin is not known until take-off. After the choice is made, either one or all three of the remaining planes follow the president as back-up. And he can call upon 68 fighter jets from the special Russian Aerospace Forces to repel attacks. Photographs of the interiors were leaked onto the internet several years ago and caused outrage among Russian citizens.